Over the last decade, hundreds of millions of gallons of sewage have been drifting down Georgia's Withlacoochee River, crossing the Florida border and joining up with the iconic Suwannee River in Madison County, FL. In December 2018, massive rain caused the manhole covers in Valdosta to blow off, causing flooding in Valdosta and millions of gallons of sewage to be dumped into the Withlacoochee, sewage which drifted across the GA/FL border into North Florida. Many consider this the straw that broke the camel's back. Senator Bill Montford opens the Committee hearing. 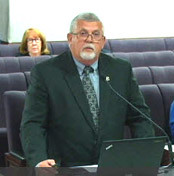 Wednesday afternoon, March 20, 2019, the Florida Senate Environment and Natural Resources Committee (the Committee), chaired by Senator Bill Montford (D-District 3) held a workshop to specifically address the cross-border sewage flow. 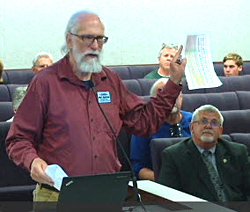 The lack of effective outreach by the North Central Florida Regional Planning Council (NCFRPC) kept most everyone in the dark about Senator Montford's last minute addition of the workshop to the committee's agenda. However, representatives from the Suwannee River Water Management District and FL Department of Heath were on hand to address the committee. The Middle and Lower Suwannee River Task Force (the Task Force) was formed late last year specifically to address the sewage issue. The Task Force is facilitated by the NCFRPC. It has members from 12 N. Central FL counties. Rick Davis, Madison County Commissioner, addresses the committee. Task Force Chairman Rick Davis (Madison County commissioner) and member Ken Cornell (Alachua County commissioner) were on hand at the committee meeting. Mr. Cornell was informed about the meeting the day before. Chairman Davis told the Committee that Florida counties along the downstream route of the Suwannee River have been trying to cooperate with the folks in the City of Valdosta. Chairman Davis pointed out that the sewage spills coming from Valdosta have been ongoing for over a decade and amount to hundreds of millions gallons of sewage floating down river into Florida. Chairman Davis said, "Valdosta's failure in the past to maintain their infrastructure when it comes to their sanitary sewer and their treatment plants has caused a significant amount of environmental and health hazards for our citizens in the state of Florida." He added, "This is our red tide." Mr. Davis also pointed out the sewage coming into Florida affects all areas along the Suwannee River to the clam beds in Levy County. Senator Montford, after listening to the SRWMD and the FLDOH, said, "What concerns me is that this has been going on for years. They put in a new plant and they still got the problem... Who's on first? Let's get it on. I don't want to be sitting here a year from now and you all be talking to me about sewage spills from Valdosta. Maybe we go on a field trip up there. That would be all right. We are all well intentioned. They're good neighbors, so let's call on the good neighbor spirit here and say, 'You all need to fix your problem.'" Commissioner Cornell followed up, "We want to recognize them for the effort that they've had over the last couple of years, but we also know that a three to four inch weather event - heck, we may have had that while we were in here -- the weather is not going to get less rainy.... We want to work them; we want to work with our federal agencies; with our federal senators; and both of our governors. Ultimately, we want them to solve this problem.... We want to step up our testing and data analysis so that in a year from now if you senator (Montfort) say, 'nothing's changed' we can say, 'right.'" The last speaker of the day was Florida small county legend, the top gun of the Small County Coalition, Chris Doolin, who explained that folks in Florida, south of the Valdosta spills, are finding out about the spills dangerously after the fact. 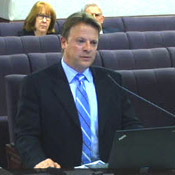 Mr. Doolin said, "One of the issues here is lapse in time notice, from the wastewater plant or whomever. We need to know that [about a sewage spill] ASAP." He added, "The second point is documentation, because if this is not fixed, then the Clean Water Act is there and these spills exceed the standards of the Clean Water Act." John Quarterman, who resides not far from Valdosta, made available spread sheets, detailing the spills. The Task Force feels that Federal laws, read EPA and the U.S. Clean Water Act, prohibit the sewage flow from Georgia across the border into Florida. The Task Force has stated that litigation is not its first choice and believes that collaboration is the preferred method of resolution. Additionally, most Task Force members understand that the crumbling underground infrastructure in Valdosta is an endemic problem in most, if not all cities and communities in America, but along with this understanding, also comes the understanding that the sewage coming across the border from Georgia must stop. Recently, the Task Force and the City of Valdosta have been coming together on collaboration, rather than confrontation. Valdosta has recently softened its views on listening to the Taskforce and Taskforce Chairman Rick Davis is working hard to keep the communication channels open and active. A workshop is scheduled for April 10 in Valdosta between the parties. Senator Montford had the last word, "We take this all seriously. We wouldn't have asked you to come up here. We won't just let this go in the file. We'll work on it." He then adjourned the meeting.